This paper discusses the significant role of the Indonesian Communist movement in the formation of Jose Maria Sison as a leading Filipino Marxist radical and its possible influence on the founding of the Communist Party of the Philippines (CPP) in 1968. After a study fellowship in Indonesia in 1962, Sison published pioneering translations of Chairil Anwar’s poetry and popularized matters pertaining to Indonesia during the Sukarno era through the journal Progressive Review. He also had a memorable and intellectually fruitful friendship with the Indonesian nationalist guerrilla and University of the Philippines graduate student Bakri Ilyas. A small but persistent controversy on the alleged plagiarization by Sison of Indonesian radical sources in the late 1960s and early 1970s will then be addressed through systematic textual analysis. The paper will propose some general theses on authorship, modularity, adaptation, and dissemination of texts and ideas in twentieth-century radical movements. Finally, the article will assess the impact of the 1965–66 massacre in Indonesia on the revolutionary ideas and practice of the CPP. Any complete history of radicalism in Southeast Asia must include the episodic but vital interactions between generations of Philippine and Indonesian Communists. It is a well-known fact that Tan Malaka (1897–1949), former chairman of the Partai Komunis Indonesia (PKI, Communist Party of Indonesia, founded in 1920) and agent of the Eastern Bureau of the Comintern, spent some time in the 1920s in the Philippines, where he acquainted himself with Philippine history and society and reportedly developed warm friendships with political progressives such as Crisanto Evangelista (1888–1943), who founded the Partido Komunista ng Pilipinas (PKP, Communist Party of the Philippines) in 1930. Tan Malaka’s autobiography Dari Penjara ke Penjara (From jail to jail) (1948) and chief theoretical work Madilog: Materialisme, Dialektika dan Logika (Materialism, dialectics, and logic) (1943) contain richly detailed sections dealing specifically with the Philippines (see Guillermo 2017). In the early 1960s, not long after Tan Malaka’s death, Jose Maria Sison (1939–), a Filipino activist and student of literature, initiated a new phase in Indonesian-Philippine Communist interactions which continued until the destruction of the PKI in the massacre of 1965 and the foundation of the Maoist-oriented Communist Party of the Philippines (CPP) in 1968. It was around this time also that Sison shared a deep and comradely friendship with Bakri Ilyas (?–2003), a highly decorated PKI-affiliated former army officer who was a student at the University of the Philippines. This study seeks to shed light on this second episode. In 1961 Sison’s graduate scholarship and teaching fellowship at the Department of English, University of the Philippines, were abruptly terminated because of his increasingly militant political involvement. 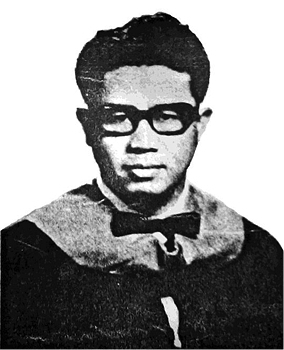 Later that year, at the age of 22, Sison decided to take up a scholarship in Indonesian language and literature in Jakarta through the Jajasan Siswa Lokantara.1) At the time, Indonesia under President Sukarno was a veritable mecca for Southeast Asian radical and nationalist intellectuals and was also the home of the PKI, the third largest Communist party in the world (Sison 2004, 13). However, things did not go as smoothly as expected: Sison experienced problems obtaining a passport since he had been blacklisted as a “subversive” by the National Intelligence Coordinating Agency. His uncle Sixto Brillantes, who was at the time the chairman of the Commission on Elections, had to personally request President Carlos Garcia to facilitate the issuance of his passport until it was eventually released late in 1961. In a portent of things to come, prior to his departure for Indonesia Sison was contacted by the pro-Soviet PKP. Jesus Lava, the Party’s secretary-general, had apparently taken an interest in the young Sison’s activities and early anti-imperialist writings and had sent his nephew Vicente Lava, Jr., to propose a meeting. However, it was only upon his return to the Philippines in late 1962 that Sison was finally able to meet with the Lavas (Sison 1989, 44; 2004, 13).
. . . the most rabid anticommunist columnists in the Philippine Herald called me an agent of the Communist Party of Indonesia because I was the secretary general of the Philippine-Indonesian Friendship and Cultural Association. After Sukarno came to Manila for the Maphilindo conference in 1963, the yellow tabloid started to call me an agent of Sukarno and even accused me of fronting for him as a buyer of a Forbes Park mansion for an alleged Filipino girl friend of his, the prominent socialite Amelia de la Rama, whom I did not know from Eve. The only time I was in the company of Sukarno and a pretty woman was when I sat between him and the movie actress Josephine Estrada at a brunch tendered for him in 1963 by then Speaker Jose Laurel at his Shaw Boulevard residence. The first time was when I went there to study Bahasa Indonesia and observe the mass movement from January to June 1962. The second time was in 1963 when I delivered the letter from the PKP to the PKI confirming fraternal relations between the two parties based on the initial discussion with the representatives in Manila (the representatives of the PKI were members of the Central Committee who came with Sukarno’s delegation). The third time was in 1964 when I arranged the participation of the Kabataang Makabayan (Nationalist Youth) in the international youth conference of 1964 and the delegation of the Philippines to the international conference against US military bases in 1965. The name of the Indonesian comrade who was a friend to me and Julie was Ilyas Bakri. He had taken up a master’s in business administration in UP as a scholar of the Indonesian government. He had the rank of captain in the Indonesian army and came from a Communist family in Sumatra. I know that he was a member of the PKI and was connected to the Central Committee of the PKI. Hindi ko alam kung may naunang nagsalin sa mga tula niya sa Ingles. Bago ko inaral at isinalin ang mga tula niya noong 1962, nalathala na ang Brothers and Other Poems noong pang 1961. Maaring sabihin na pareho kaming impluwensiyado ng mga Kanluranin at modernong manunulat na sina Rilke, Auden at Hemingway, laluna sa paggamit ng tuwirang wika, mga metapor at mga imahe. I did not know if there were any previous translations of his poems into English. Before I studied and translated his poems in 1962, Brothers and Other Poems had already been published in 1961. It could be said that we were both influenced by Western and modern writers such as Rilke, Auden, and Hemingway, especially in the use of direct language, metaphor, and images. In the Philippines today, there is a rising and vibrant wave of interest in Indonesia—its people, its leadership, its policies and principles, its potential, its current problems, its efforts, its achievements and its future. In response to this interest, we have decided to put out this special issue on Indonesia which includes the most basic and most comprehensive policy declarations by President Soekarno, such as the Political Manifesto, the Economic Declaration and the Belgrade Speech on the policy of non-alignment . . . The Filipino and Indonesian peoples are mutually realizing with profoundest sentiments that they are blood-brothers, close neighbours, proud sharers of an early pre-colonial culture and, that it is only natural that they pool their potential and embark on joint action and cooperation in the face of the old established forces of colonialism and neocolonialism that continue to threaten and hamper their security and development. The same issue of PR included an article by Salipada R. Pendatun titled “Betrayal in Southeast Asia”; an essay by Dr. Juan M. Arreglado on “Our Relationship with Indonesia”; and a piece by Abdul Rahim bin Karim, a Malaysian student leader, titled “Kalimantan Utara Revolt: War Against Imperialism.” Iljas (or Ilyas) Bakri, Sison’s Indonesian friend, was listed as a contributing editor in the third issue of the journal. This issue had an article by the prominent Filipino intellectual who would later on become president of the University of the Philippines, Salvador P. Lopez, titled “Malaysia and Maphilindo.” Sison and other Filipino progressives asserted their solidarity with Indonesia by taking a stand against the formation of Malaysia as an imperialist ploy (Sison 1989, 27–28). Probably the final article on Indonesia in the pages of this journal was in the ninth issue, when it was under the sole editorship of Nemenzo. The article was written by the journalist Eric Norden and titled “The Rightist Coup in Indonesia.” And after that, silence. Philippine Society and Revolution: Indonesian Influence or Plain Plagiarism? 3)	Sison then simply changed the “names and places” in the Indonesian work and called the book Philippine Society and Revolution (PSR). Which Indonesian Maoist was Magno referring to? If it was Dipa Nusantara Aidit, as Ken Fuller (2011, 75) surmises, then which work of Aidit did Sison allegedly plagiarize? There is no mention here of Sison’s Indonesian friend Bakri Ilyas, who did not apparently leave any writings to plagiarize. If it was another Indonesian Maoist and not Aidit, then what is his name and which work of his is being referred to? If Sison did indeed plagiarize a specific work by a particular “Indonesian Maoist,” is it true that he actually just changed the names and places? Magno makes no effort to prove this assertion. Furthermore, in what way has Magno demonstrated that the “Indonesian Maoist” in question had just “simplistically” applied Mao’s “elementary analysis” from China to Indonesia? It must be noted that the enormous condescension of posterity that Magno allows himself by throwing about words like “simplistic” and “elementary” to describe the ideas and motivations of historical actors just cannot work in any serious approach to intellectual history. In the September 2007 column, Magno asserted that Sison had “plagiarized” an “Indonesian Maoist” in the early 1960s. However, in the second version above, he surmised that a “leading Indonesian communist” who had fled from the 1965 massacre was able to establish contact with Sison’s group. This alleged meeting explains why Sison’s “analysis” was “largely lifted” from that of the PKI. Could Magno have been referring to Bakri? However, according to Sison, Bakri was already in Indonesia by 1965, just before the massacre. The unthinking repetition of Magno’s unsubstantiated allegations by writers like Fuller seems to reinforce their veracity without actually proving anything. This textbook, which was put together by Comrade D. N. Aidit, is meant as a textbook for Party Schools in the center and the provinces. . . . We published this book with the conviction that this work will be of great value, not only for revolutionary cadres but also for the growth of the revolutionary movement itself. MIRI was translated into English and Russian in 1958 (Aidit 1958a; 1958b) and into German in 1959 (Aidit 1959a). Its final Indonesian edition was a seventh printing in 1965 (Aidit 1965). PSR was published simultaneously in English and Filipino in 1971 (Guerrero 1971a; 1971b) and translated into German in 1973 (Guerrero 1973). Its fifth edition was printed in 2006 (Sison 2006). A comparison of the table of contents of both works reveals a relatively close correspondence (Table 2). 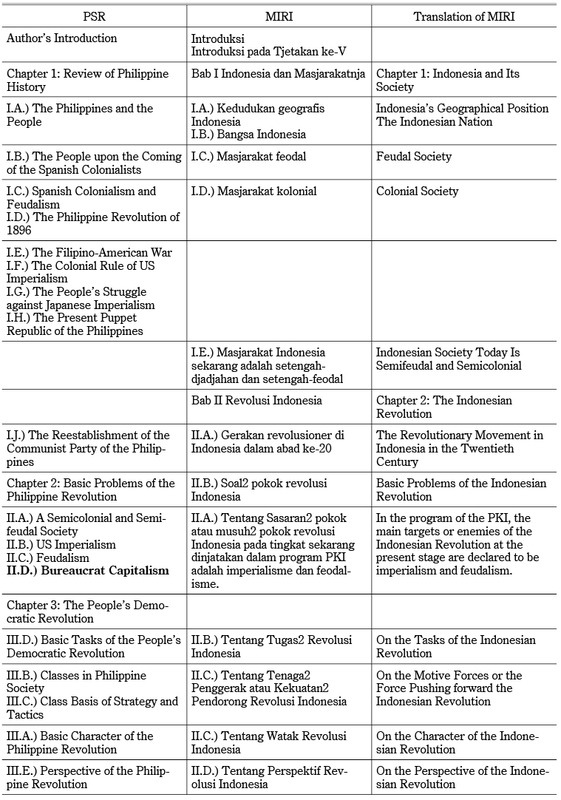 The topic of chapter 2 of MIRI (“The Indonesian Revolution”) overlaps with the latter part of the first historical chapter of PSR (“The Reestablishment of the CPP”) and contains the corresponding topics of both chapters 2 (“Basic Problems of the Philippine Revolution”) and 3 (“The People’s Democratic Revolution”) of PSR. Justus van der Kroef commented that PSR was similar “in organization, terminology and substance . . . [to] the analysis of Indonesian society and revolution written by the late chairman of the Indonesian Communist Party, Dipa Nusantara Aidit” (Van der Kroef 1973; Weekley 2001, 21). However, with respect to the actual content of both works, some rather striking differences come to the fore. There was none or almost no category of bureaucrat capitalism in Aidit because he clung too much to NASAKOM and to Sukarno and the PKI and Aidit only whispered about bureaucrat capitalism or corruption among the “social democrats” or “socialists” and others whom Sukarno had given economic portfolios in his Cabinet. A few PKI cadres were also in lower but also lucrative posts. But they turned over to the PKI what they earned beyond their modest family needs. What, then, of the alleged similarities between MIRI and PSR? If Magno’s charge that Sison had simply changed “names and places” is taken at a literal level, then there are ways of empirically verifying or refuting this by using methods such as “n-gram” analysis. An n-gram is a sequence of n contiguous elements, which for the present purposes are understood as consisting of words in a particular text. A test for the similarity between two texts could be conducted quite easily by using n-gram analysis. A further simplifying assumption is that Sison used the English translation of Aidit’s work rather than the original one in Bahasa Indonesia. Common sequences of lexical items can be automatically sought out in both MIRI and PSR. In this particular case, detecting word sequences that appear just once in both texts and consist of a minimum of four words could serve as a good basis for identifying areas of possible similarity in the texts. The reason for looking for a common sequence of four or more words is that, by rule of thumb, the likelihood of finding common sequences of three words and below in both texts is much greater and therefore much less likely to indicate unique textual features. On the other hand, making the minimum sequence length too long might make certain interesting features undetectable. Moreover, by limiting the number of occurrences to one in both texts, the likelihood is reduced (but obviously not eliminated) that the repeating sequence is a commonly repeating phrase or fixed expression. A high frequency of occurrence of these sequences in two texts would point to the possibility of plagiarism. One can observe initially that many of the sequences occurring in MIRI and PSR are fixed phrases in the English language as a whole or within the genre of late twentieth-century Marxist-Leninist revolutionary texts. Some examples from PSR and MIRI of high-frequency shared n-grams are the following: “the broad masses of people” (MIRI: 3; PSR: 28); “under the leadership of” (MIRI: 8; PSR: 6); “exploitation of the people” (MIRI: 1; PSR: 6); “the vast majority of” (MIRI: 3; PSR: 4); “of the world proletarian revolution” (MIRI: 1; PSR: 5). These fixed phrases are obviously of too general usage in the Marxist-Leninist literature to be indicative of any deeper textual connection beyond ideological affinity. The n-gram sequences occurring once each in MIRI and PSR with four or more lexemes add up to a total of around 272. There is a single n-gram with a length of 10 shared by both texts (“the rich peasants, the middle peasants and the poor peasants”). The next longest n-grams have a length of eight each (“the political economic and cultural development of [the Philippines/Indonesia]”; “the present stage of the [Philippine/Indonesian] revolution is”). The great majority of single-occurrence shared n-grams each have four elements and number 172. Most of these 4-gram sequences, when queried, do not actually reveal areas of textual similarity (for example, “a class that is,” “a proletarian socialist revolution,” “and most reliable ally,” “basis of the colonial,” “joint dictatorship of the,” “the compradors and the,” “system of rent payment,” “the proletariat is capable of,” “the revolutionary struggle against,” “[the Philippines/Indonesia] is an archipelago”]) which could support allegations or give rise to suspicions of plagiarism or lifting. What can instead be observed is the use of a kind of common “revolutionary lingua franca” (Hau, email to the author, December 10, 2015). The lumpen proletariat, this passive rotting of the lowest strata of the old society, will be partly thrown into the movement by the proletarian revolution, but it is more disposed, given its conditions of life, to let itself be bought by the reactionary intrigues. If one compares PSR, MIRI, and the writings of Mao about the classes in Chinese society and the new democratic revolution, one would immediately observe surface similarities because they all used Marxist-Leninist theory in analyzing the history, circumstances and revolutionary future of the semicolonial and semifeudal societies of China, Indonesia, and the Philippines. But a deeper study of these works will reveal big differences. . . . I read and studied in English and Bahasa Indonesia the writings of Aidit; but beyond Aidit, I saw the events in Indonesia in 1965 and read and studied the self-criticism of the PKI Politburo in 1966 which showed Aidit’s errors in ideology, politics, and organization. This means that PSR is not just a copy of MIRI. . . . Rocamora is mistaken in saying that the CPP only followed Aidit of the PKI instead of Mao or the CPC in the analysis of Philippines society and in establishing the revolution. What does it mean to raise questions of plagiarism with respect to a text like Philippine Society and Revolution? It is quite clear that the most common and necessarily political agenda behind such accusations would be to destroy the credibility of the authors of such texts by shaming and discrediting them intellectually. However, when one considers the specific conjunctures wherein such allegations have arisen, one could also frame such accusations more specifically within contexts of theoretical struggles within the Party. The insinuation of plagiarism can thus serve as a convenient device to undermine the legitimacy and validity of the theoretical positions proposed in PSR. Notions of “copying” and “mechanical application” seem to prove conclusively the crude, simplistic, and shallow nature of the theories in question. One of the basic mistakes of the Party in studying from the Chinese revolution at that time was the Party only tried to find out the similarities between the Chinese revolution and the Indonesian revolution. According to experiences in China, for an underdeveloped country such as Indonesia, guerrilla warfare, the creation of liberated guerrilla areas and the organisation of a people’s army in these areas is one of the correct forms of struggle to achieve complete national independence. But in Indonesia, this form of struggle did not have the broad possibilities available in China. This is because of the peculiar conditions of this country. The most advantageous conditions for guerrilla warfare are extensive regions, mountainous areas and forest lands both wide in extent and far from towns and highways. The conditions in Indonesia met only some of these requirements. Further, we know from the experiences of the Chinese Communists that it was only after they had reached the Northeast area, which borders on the Soviet Union, that they had a rear on which they could rely. With the Soviet Union as their rear, Chiang Kai-Shek could no longer encircle the Chinese revolutionary forces. Moreover, after being able to prevent the possibility of enemy encirclement, the Chinese Communists were in a position to launch planned attacks on the Chiang Kai-Shek troops. The Indonesian revolution did not possess such conditions. Indonesia is a country composed of islands. An Indonesian people’s liberation army cannot rely upon a friendly neighbouring country as its rear because it does not have one. There are three outstanding characteristics of the Philippines in being an archipelago. First, our countryside is shredded into so many islands. Second, our two biggest islands, Luzon and Mindanao, are separated by such a clutter of islands as the Visayas. Third, our small country is separated by seas from other countries. From such characteristics arise problems that are very peculiar to our people’s war . . . Waging a people’s war in an archipelagic country like ours is definitely an exceedingly difficult and complex problem for us . . . The Philippine appreciation of the “lessons” of the Indonesian experience of 1965, and the Indonesian Left’s openness to parliamentary struggle prior to the debacle, somehow cemented the idea of the inevitability of armed revolution as the only solution to the contradictions facing Philippine society. I and other Filipino comrades were saddened and angered by the widespread massacre in 1965, and we looked into the causes behind it. The PKI Politburo itself had written a comprehensive and deep self-criticism. This had the greatest influence on the CPP, more than any work by Aidit. . . . The PKI’s self-criticism agreed with the teachings of Mao. It confirmed Mao’s line that if the Party and the people had no people’s army, they had nothing. This being the case, the CPP consolidated the formation of the NPA only three months after the founding of the Party. This article would not have been possible without Jose Ma. Sison’s generous cooperation. The author would also like to thank the following for the various ways they helped in writing and improving this article: Yerry Wirawan, Show Ying Xin, Jafar Suryomenggolo, Jeff Hadler, Jun Aguilar, Tom Talledo, and Caroline Hau. Abaya, Antonio C. 2007. Defeating the Communists. Manila Standard Today. February 1. ―. 2006. McCarthyists. Manila Standard Today. June 29. Abinales, Patricio N. 2001. Fellow Traveler: Essays on Filipino Communism. Quezon City: University of the Philippines Press. Adam, Asvi Warman. 2005. History, Nationalism and Power. In Social Science and Power in Indonesia, edited by Vedi R. Hadiz and Daniel Dhakidae, pp. 247–274. Singapore: Institute of Southeast Asian Studies. Aguilar, Filomeno V., Jr. 2005. Tracing Origins: “Ilustrado” Nationalism and the Racial Science of Migration Waves. Journal of Asian Studies 64(3): 605–637. Aidit, D. N. 1965. Masjarakat Indonesia dan Revolusi Indonesia: (soal pokok Revolusi Indonesia) [Indonesian Society and the Indonesian Revolution: Main problems of the Indonesian Revolution]. Tjet. 7. Djakarta: Jajasan Pembaruan. ―. 1964. Masjarakat Indonesia dan Revolusi Indonesia: Soal2 pokok Revolusi Indonesia [Indonesian Society and the Indonesian Revolution: Main problems of the Indonesian Revolution]. Tjet. 6. Djakarta: Jajasan Pembaruan. ―. 1962. Masjarakat Indonesia dan Revolusi Indonesia: Soal2 pokok Revolusi Indonesia [Indonesian Society and the Indonesian Revolution: Main problems of the Indonesian Revolution]. Tjet. 5. Djakarta: Jajasan Pembaruan. ―. 1960. Masjarakat Indonesia dan Revolusi Indonesia: Soal2 pokok Revolusi Indonesia [Indonesian Society and the Indonesian Revolution: Main problems of the Indonesian Revolution]. Tjet. 4. Djakarta: Pembaruan. ―. 1959a. Die indonesische Gesellschaft und die indonesische Revolution: Grundfragen der indonesischen Revolution [Indonesian Society and the Indonesian Revolution: Main questions of the Indonesian Revolution]. 1. Aufl. Übersetzt von Rose Gromulat. Berlin: Dietz Verlag. ―. 1959b. Masjarakat Indonesia dan Revolusi Indonesia: Soal2 pokok Revolusi Indonesia [Indonesian Society and the Indonesian Revolution: Main problems of the Indonesian Revolution]. Tjet. 3. Djakarta: Jajasan Pembaruan. ―. 1958a. Indonesian Society and the Indonesian Revolution. Jakarta: Jajasan Pembaruan. ―. 1958b. Indonezijskoe obŝestvo i indonezijskaja revoljucija: Osnovnye problemy indonezijskoj revoljucii Индонезийское общество и индонезийская революция: основные проблемы индонезийской революции [Indonesian society and the Indonesian Revolution: The main problems of the Indonesian Revolution]. Moskva: Gos. izd-vo polit. lit-ry. ―. 1955. The History of the Communist Party of Indonesia. New Delhi: People’s Publishing House. Alston, Philip. 2008. Report of the Special Rapporteur on Extrajudicial, Summary or Arbitrary Executions. Mission to the Philippines. United Nations Human Rights Council. Bakri Ilyas. 1998. Surat ex tapol 1965 Bakri Ilyas Kepada Komnas HAM [Letter from former political prisoner 1965 Bakri Ilyas to the National Commission on Human Rights]. July 31. Jakarta. Chairil Anwar. 2015. 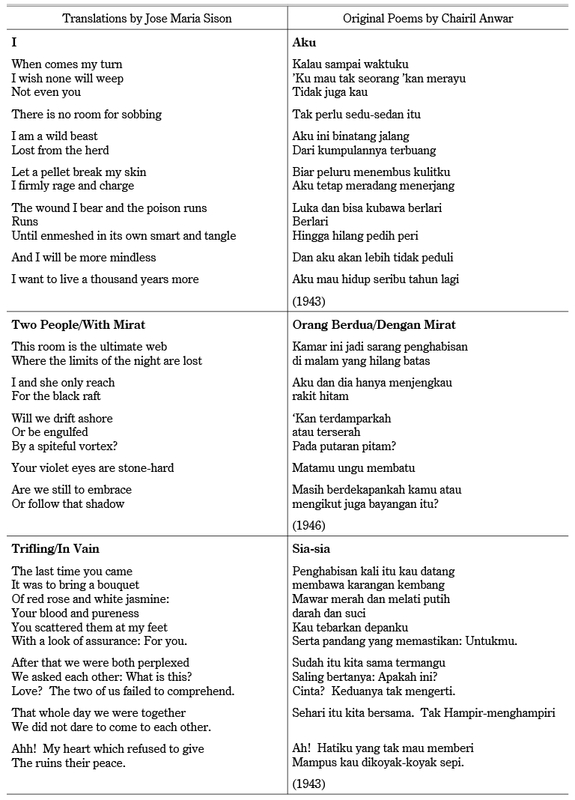 Aku ini binatang jalang: Koleksi sajak 1942–1949 [I, this wild animal. Poetry collection 1942–1949], edited by Pamusuk Eneste. Selangor: Dubook Indo. ―. 1970. The Complete Poetry and Prose of Chairil Anwar, edited and translated by Burton Raffel. Albany: State University of New York Press. ―. 1963. 3 Poems, translated by Jose Ma. Sison. Progressive Review (July–August): 109–111. De Villa, Maria Theresa L. 2002. Teorya at praktika sa pagsasalin ng Philippine Society and Revolution ni Amado Guerrero 1968–1982 [Theory and practice in translating Philippine Society and Revolution by Amado Guerrero 1968–1982]. Quezon City: UP Center for Integrative and Development Studies. Delfin, Frederick C. 2015. 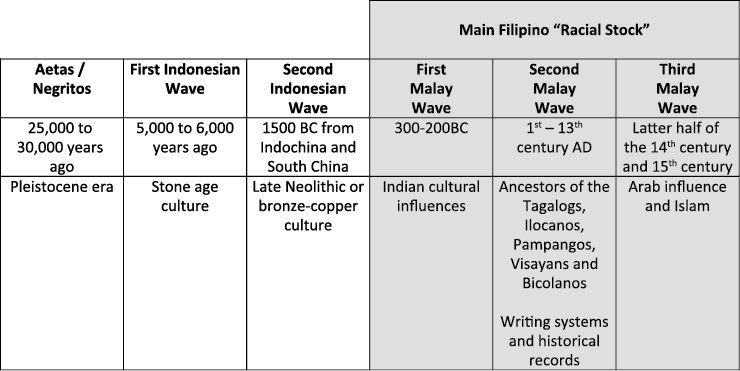 The Population History of the Philippines: A Genetic Overview. Philippine Studies: Historical and Ethnographic Viewpoints 63(4): 449–476. Fuller, Ken. 2011. A Movement Divided: Philippine Communism, 1957–1986. Quezon City: University of the Philippines Press. Gealogo, Francis A. 2005. (Re)locating the Genealogy of Radical Philippine Historiography in Southeast Asia: Philippine National Democratic History and the Imaginings of Southeast Asian National Histories. Paper prepared for the Workshop on Local Scholarship and the Study of Southeast Asia: Bridging the Past and the Present, Puncak, Indonesia. July. Guerrero, Amado. 1994. Lipunan at rebolusyong Pilipino [Philippine society and revolution]. 4th ed. Hilagang Luson: Pambansang Kawanihan sa Pagsasalin. ―. 1982. Lipunan at rebolusyong Pilipino [Philippine society and revolution]. 3rd ed. Hilagang Luson: Pambansang Kawanihan sa Pagsasalin. ―. 1980. Philippine Society and Revolution (including “Specific Characteristics of Our People’s War” and “Our Urgent Tasks”). 4th ed. Oakland: International Association of Filipino Patriots. ―. 1979. Philippine Society and Revolution (including “Specific Characteristics of Our People’s War” and “Our Urgent Tasks”). 3rd ed. Oakland: International Association of Filipino Patriots. ―. 1973. Philippinische Gesellschaft und Revolution [Philippine society and revolution]. Münster: Verl. Kommunistische Texte. ―. 1972. Philippine Society and Revolution. Quezon City: Bandilang Pula Pub. ―. 1971a. Lipunan at rebolusyong Pilipino [Philippine society and revolution]. Manila: Lathalaang Pulang Tala. ―. 1971b. Philippine Society and Revolution. Hong Kong: Ta Kung Pao. ―. 1971c. Philippine Society and Revolution. Manila: Pulang Tala. Guillermo, Ramon. 2017. Andres Bonifacio: Proletarian Hero of the Philippines and Indonesia. Inter-Asia Cultural Studies 18(3): 338–346. Jalandoni, Luis. 2013. Tribute to Comrade Francisca C. Fanggidaej, Indonesian Revolutionary and Valued Friend of the Filipino People. http://www.philippinerevolution.net/statements/20131117_tribute-to-comrade-francisca-cfanggidaej-indonesian-revolutionary-and-valued-friend-of-the-filipino-people, accessed on December 5, 2015. Liwanag, Armando. 1999. On the Indonesian Revolutionary Struggle. Statement by the Chairman, Central Committee, Communist Party of the Philippines. Magno, Alex. 2007a. Old. Philippine Star. December 27. ―. 2007b. Impostor. Philippine Star. September 11. Mao Tse-Tung. 1965. Analysis of the Classes in Chinese Society. In Selected Works of Mao Tse-Tung, Vol. 1, pp. 13–21. Peking: Foreign Languages Press. Partai Komunis Indonesia (PKI). 1968. People of Indonesia, Unite and Fight to Overthrow the Fascist Regime (Including a Self-Criticism by the Indonesian Communist Party, 1966). Peking: Foreign Languages Press. Rocamora, Joel. 1994. Breaking Through: The Struggle within the Communist Party of the Philippines. Pasig City: Anvil Publishing. Salazar, Zeus. 1998a. 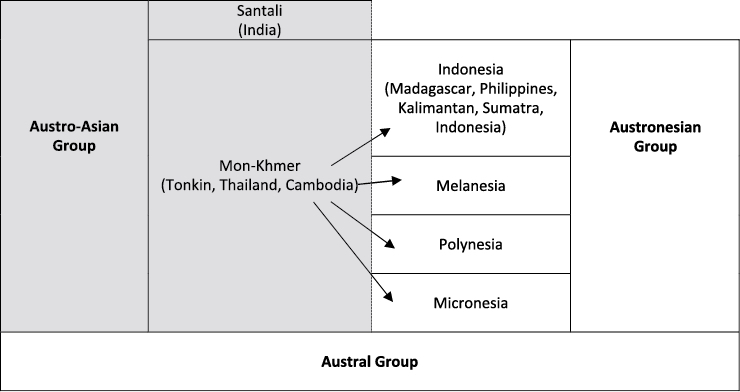 “Malay,” “Malayan” and “Malay Civilization” as Cultural and Anthropological Categories. In The Malayan Connection: Ang Pilipinas sa Dunia Melayu [The Malayan connection: The Philippines in the Malay world], pp. 81–143. Quezon City: Palimbagan ng Lahi. ―. 1998b. Für eine Gesamtgeschichte des Malaiisch-Philippinisch-Indonesischen Kulturraums [Toward a complete history of the Malay-Philippine-Indonesian culture area]. In The Malayan Connection: Ang Pilipinas sa Dunia Melayu [The Malayan connection: The Philippines in the Malay world], pp. 283–300. Quezon City: Palimbagan ng Lahi. Schmidt, P. W. 1906. 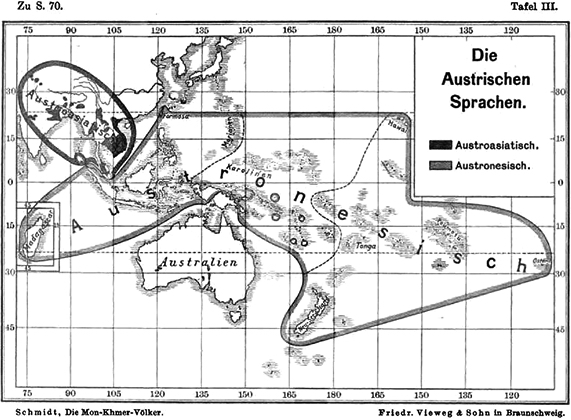 Die Mon-Khmer-Völker: Ein Bindeglied zwischen Völkern Zentralasiens und Austronesiens [The Mon-Khmer: A link between the Central Asian and Austronesian peoples]. Braunschweig: Druck und Verlag von Friedrich Vieweg und Sohn. Scott, William Henry. 1992. Looking for the Prehispanic Filipino and Other Essays in Philippine History. Quezon City: New Day Publishers. Self-Criticism by the Political Bureau of the Central Committee of the Indonesian Communist Party, September 1966. https://www.marxists.org/history/indonesia/PKIscrit.htm, accessed on December 5, 2015. Sison, Jose Maria. 2006. Philippine Society and Revolution. 5th ed. Quezon City: Aklat ng Bayan. ―. 2004. Jose Maria Sison: At Home in the World. Portrait of a Revolutionary. Conversations with Ninotchka Rosca. Manila: IBON Books. ―. 1989. The Philippine Revolution: The Leader’s View. Interviews by Rainer Werning. New York: Taylor & Francis. ―. 1963a. Filipino-Indonesian Brotherly Relations. Philippine Review (May–June): 12–13. ―. 1963b. Editorial: The Philippines and Indonesia. Philippine Review (July–August): 1–2. ―. 1961. Brothers and Other Poems. Manila: Filipino Signatures. Sison, Jose Maria; and de Lima, Julieta. 2003. To the Family of Bung Drs. Bakri Iljas. Unpublished letter of condolence, November 30. https://josemariasison.org/inps/iljas301.htm, accessed on December 5, 2015. Stammen, Theo; and Classen, Alexander, eds. 2009. Karl Marx: Das Manifest der kommunistischen Partei [Karl Marx: The Communist manifesto]. Paderborn: Wilhelm Fink UTB. Tan Malaka. 2008. Madilog: Materialisme, dialektika, logika [Materialism, dialectics, and logic]. Jakarta: LPPM. University of the Philippines. 1965. The Philippinensian. Manila: University of the Philippines. Van der Kroef, Justus. 1973. The Philippine Maoists. Orbis XVI (4): 910. Weekley, Kathleen. 2001. The Communist Party of the Philippines, 1968–1993: A Story of Its Theory and Practice. Quezon City: University of the Philippines Press. 1) No further information can be found on Jajasan Siswa Lokantara. It was probably discontinued after 1965. 2) According to Sison, “Tuluy-tuloy ang ugnayan ng CPP at PKI dahil sa may kinatawan ang mga ito sa Beijing” (The communication between the CPP and the PKI continued [even after 1965] because they had representatives in Beijing) (Jalandoni 2013). 3) Burton Raffels’ translations (Chairil Anwar 1970) came out in 1962, the very year Sison was in Indonesia. 4) Caroline Hau observes, “I was struck by how ‘freely’ Sison translated Chairil Anwar. If Sison were as fluent in Bahasa as he claims to have been (and there is no reason to doubt this claim), then it might also be possible to view Sison’s poems as simultaneously translations of Chairil and Sison’s ‘own’ poems in their own right—the intentional appropriation that blurs the boundaries between translator and translated and is capable of producing ‘literary’ effects (which we can see in Ezra Pound, except Pound didn’t even have Chinese) but that, in a certain sense, the term ‘plagiarism’ (in the way it is often used nowadays and by people with their own agenda) wants to disambiguate. By current definition, Shakespeare is the plagiarist par excellence” (Hau, email to the author, December 10, 2015). 6) Filomeno Aguilar (2005) offers a comprehensive history of such theories of migration in waves.